It’s my first time posting in the Food Bloggers Recipe Swap and I’m pretty excited. I probably should have just waited until the new year to begin participating, but I was just too excited! There’s been a lot going on here, as I’m sure in most people’s homes, the past two months. I’m now feeling the crunch to Christmas (and that is in no way a bad thing) and have been neglecting a lot of my blogging responsibilities, frantically scrambling to pull together a post the night before it’s due to go live. I’ve been enjoying the bit of a break though, and have revived my cross stitch hobby. Christmas time always does that to me. I’ve also just begun a new friendship and have enjoyed getting out of the house and killing time at the mall talking to another adult human being during the day. What does any of that have to do with Food Bloggers Recipe Swap? Well, nothing really. Except that by opting in for December, I committed myself to being assigned a blog, finding and recreating a recipe from that blog, and then sharing it with all of you, my dear readers. Much like the Secret Recipe Club which has sadly come to an end. For my first month, I was assigned Love and Cilantro written by Danya. Danya grew up in Jamaica and now lives in Canada where she attends culinary school. I envy her bravery to switch up her life and live out her dreams. I often think about going to culinary school, maybe after the kids are in elementary school? Danya’s blog is relatively new, just over a year old if my calculations are correct! With a shorter recipe selection than some blogs I’ve scoured you’d think my decision would be fairly simple. Think again! I’d narrowed it down to Spinach Stuffed Chicken Breast (which will still probably happen), Asian Salad, and the Raw Beet Salad I ultimately picked. Oh wait! There’s this beautiful Greek Chicken she shared on Sunday, too, dang – too late! I’m really happy with the Beet Salad, though. I mean, I love beets, so why wouldn’t I like this salad!? I don’t often work with beets raw and it was fun to do so. The vinaigrette the shredded beets are tossed in is perfectly balanced – the lemon mellows out the orange and the white balsamic is a fun new ingredient to my pantry. I didn’t have chives so very thinly sliced a scallion. I think this salad would make a beautiful addition to your holiday table this month – the bright color and flavor would brighten your plate wonderfully! Place shredded beets in a bowl. In a small bowl, whisk together the citrus, vinegar, oil, mustard, and agave. Season to taste with S+P. Toss beets with as much dressing as desired. Garnish with scallion/chives. I am not a steak-and-potatoes type of gal. Potatoes? Yes. Steak? No thanks, I’ll pass. But my husband is most definitely a steak-and-potatoes type of guy. In fact, it’s the meal he always gets when we visit his parents. I was informed that I needed to add more iron to my diet – so that means you’ll see more red meat entrees floating around Sew You Think You Can Cook. I’ve always tried to limit the red meat to once a week, typically in the form of Mexican Monday. And I am guilty of enjoying a burger quite often. 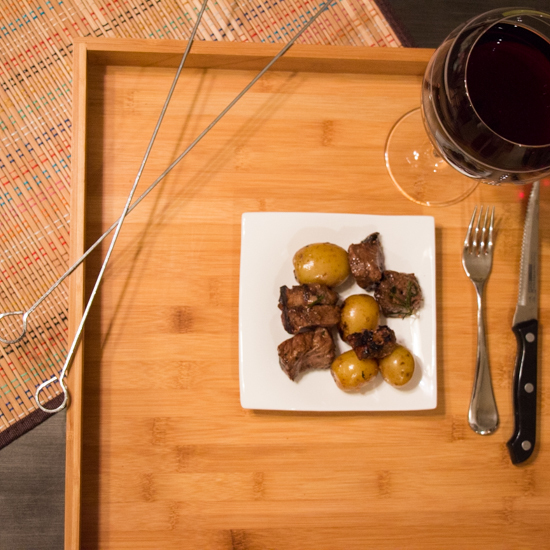 For this recipe, par-boiled potatoes share the skewer with cubes of sirloin and the result is divine. The potatoes end up resembling fries and the marinade is full of flavor. I particularly like the rosemary. Serve these skewers with your favorite vegetable and you’ve got yourself a complete meal! If you’ve had too much red meat this week, Mom made this recipe using chicken instead of steak and it worked just as beautifully. In a bowl combine garlic, rosemary, thyme, steak seasoning, balsamic vinegar, and olive oil. Pour 3/4 C of the marinade over the steak and set in the fridge. Boil potatoes for 15 minutes, until slightly fork tender. Drain. Pour the rest of the marinade over the potatoes. Skewer the steak and potatoes. 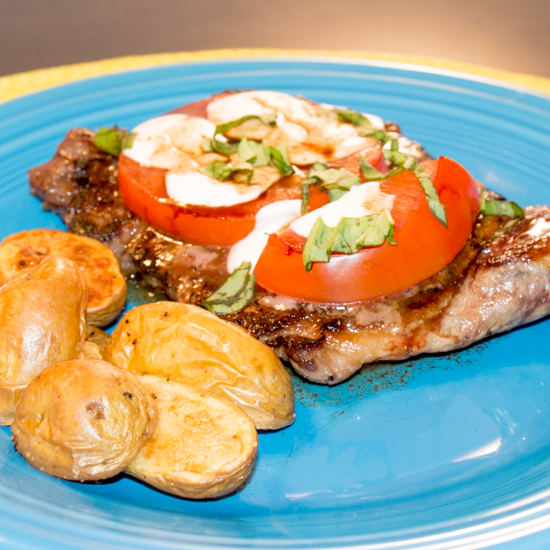 Grill until the steak is cooked to your liking and the potatoes are done. Grocery shopping is not my favorite thing. Despite my efforts to remain organized I always manage to miss something and have to back track throughout the store. But, now that I have a Publix within walking distance I use the Publix App on my phone. Not only can I browse the circular to find what’s on sale this week, but I can create my grocery list. Yes, Winn-Dixie and other grocery apps have the same ability, but Publix – the place “where shopping is a pleasure” – has surpassed customer service in the app alone. When you input your specific store, it’ll tell you what aisle that item is in. Not just “baking” but “aisle 9”. It might just be the best thing since sliced bread. Another benefit of living in Florida is that I can still find beautiful, ripe, Grown in Florida Strawberries at the store. I hadn’t thought strawberries to be in season, but Winter Strawberries are harvested between November and March. I swear, these are more beautiful than the ones I get in July. So, again, I apologize if you cannot find fresh strawberries in your local area – pin this recipe and save it for the summer. I promise you it’s worth it! 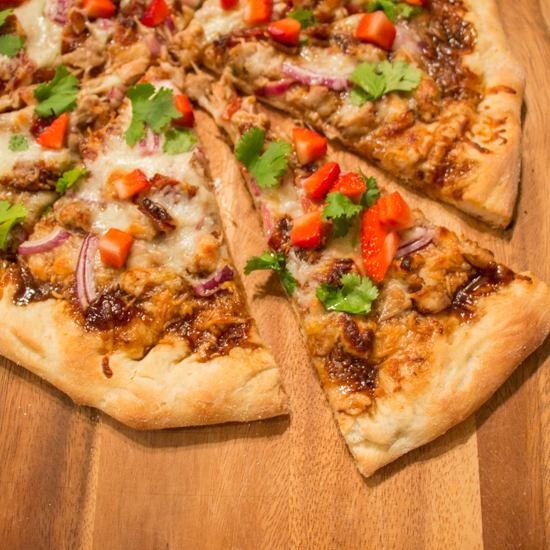 This pizza rivals any that you find at a gourmet pizza shop, and although you can roll your dough to your desired thickness, a thicker crust works beautiful with this masterpiece. Stuart questioned this dish – he thought strawberries on a pizza would be weird. But they complement the chicken and bacon and the cilantro provides a note of lightness. He pointed out, and I agree, that mint would also work well here (if you happened to have that instead). Place pizza stone in oven and preheat to 475 degrees F.
In a small saucepan bring balsamic vinegar to a boil, reduce to a simmer for 4 minutes. Add in jam and sriracha. Toss chicken with 2 tbsp of sauce and set the remainder aside. Sprinkle cornmeal onto a pizza peal, if you don’t have a a pizza peal an edge-less cookie sheet works well too. Place dough on peal. 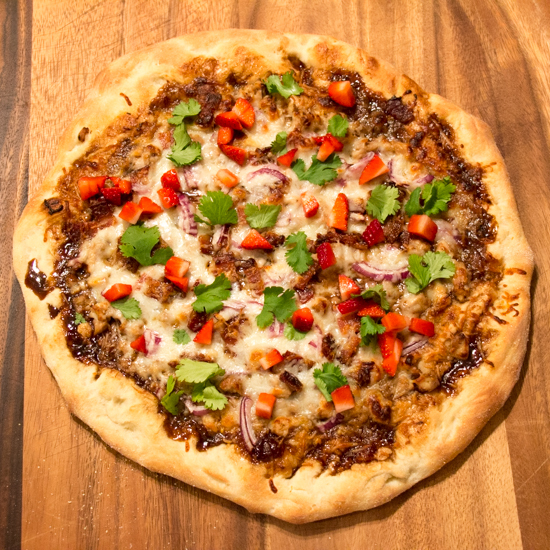 Top dough with balsamic sauce, leaving a 1″ crust. Top with chicken, 3/4 of the cheese, then the bacon and onion. Top this layer with the remaining cheese. Garnish with fresh strawberries and cilantro (or mint). Allow pizza to cool a few minutes before slicing.